Kim, I have looked the other way when it comes to your generally bad pregnancy fashion but this is blinding. I now can't see straight not because of too much of an unflattering print, but by the nerve of this dress to have attached gloves. Gwynneth I love and adore you forever but you had you giant pink dress moment when you won your oscar. This could have been in another colour. Elizabeth Banks, where do I begin here? Elle, I am fanning myself just to get through the make up. But the Tie Dye????? Again, the make up is just too intense. The dress is actually very nice on beutiful Ginnifer Goodwin but that make up? Hide it Klum, Hide it girl. Who is this and why is she carrying a box? Kerry I can forgive the fact that you also caught this flu, but I can't deal with those gloves and the ring on top. 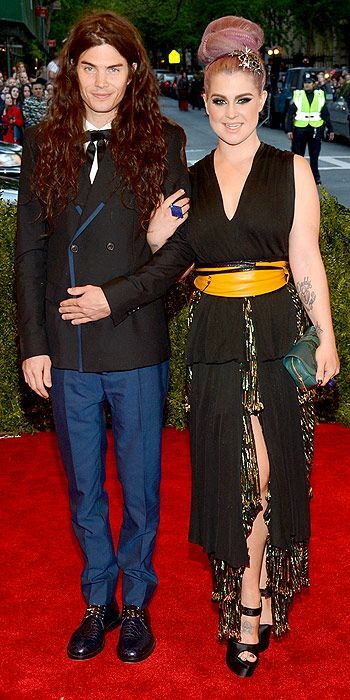 Again, someone whose style I generally admire came out looking all wrong last night. I don't even know who this is but this outfit is definitely the winner of this competition. Elbows down. LOL! This was hilarious, love your writing style Milli. I was also wondering what bug these celebs caught. The MET Gala always gets them dressing crazy but I agree this year's was just...no words. SMH...I still love Solange though! So many bad fashion choices..lol as for nicki minaj looking like she's suffocating.. I even forgot some of these people were still famous. Miley's hair is the cause of this entire epidemic, I tell ya. Poor Kelly, did she forget where she works? Also, I thiught "Felicia Mkhize" was an actual person for a seconfd there. Mary Kate takes the cake and eats it. Alicia though, looks like someone out of Nollywood movie. This was so funny. But you're 100% right. All of these outfits (especially Kim K, Madonna and Beyonce)are shockingly bad. Some of these looks don't surprise me (i'm looking at you Nicki), but others... well Kerry Washington and the Olsen's, i expected better. These women pay stylists too much money, to leave the house looking so foolish !!! wow, they must have a secret bad dress contest - otherwise these outfits cannot be explained. Solange's dress wasn't that bad. I'm so amazed...all that money and all that mess. Something was definitely going around.